Table of Contents Next: Scoones, Geoffrey A.P. 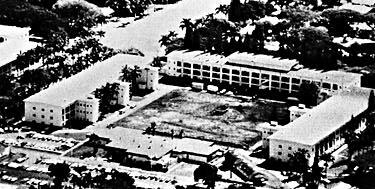 Schofield Barracks (158.01W 21.47N) was an important Army base in central Oahu, dating back to 1908. When war broke out, there were three battalions of service troops here, along with 24 Division, 25 Division, and 34 Engineer Regiment. This was the largest concentration of regular U.S. Army troops anywhere in the world. Wheeler Field was located adjacent to the base on an old cavalry drill ground.